Often referred to as Osaka soul food, Okonomiyaki (お好み焼き) literally means “grilled as you like it” in Japanese. Prepared soul-ly by you, the way you want it. Bringing you the nostalgic taste of this Japanese comfort food, by your own hands, is our vocation. Craft your own rendition of the traditional pancake-omelette by choosing your main ingredients from our wide offering of seafood, meat or vegetables before mixing them into the cabbage and green onion batter and then grilling it on the teppan. Top off with special otafuku sauce, Japanese mayo, and seaweed and bonito flakes. Looking for a more elaborate affair? 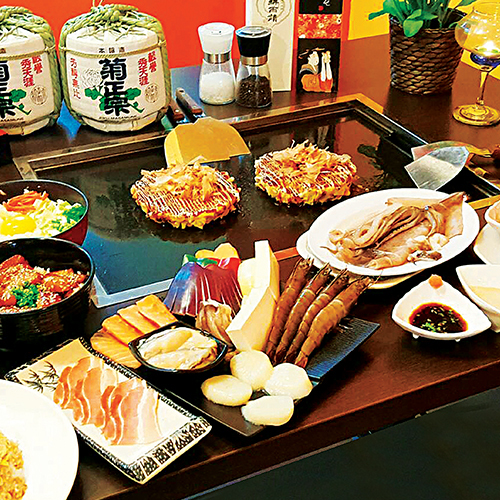 Go for the additional Teppanyaki (鉄板焼き) and complete the gratifyingly scrumptious grill-it-yourself experience. Itadakimasu!